For two days at the end of November, pro-refugee protests disrupted the final parliamentary sitting. The government wanted parliament to pass its lifetime ban on any asylum seeker who was sent to an offshore detention centre after 19 July 2013, ever being able to enter Australia. But a wave of outrage has forced the government to withdraw the Bill. Immigration Minister Peter Dutton and Prime Minister Turnbull have relentlessly claimed it was necessary to send a strong message to people smugglers, and maintain the integrity of “our” borders. But their political game is too obvious. Conservative New Zealand Prime Minister John Key struck a telling blow against the government, declaring that they would not accept a refugee subject to a lifetime ban as this would create second-class New Zealand citizens. For most people, the lifetime ban looked like a desperate move by a desperate government keen to stem their falling popularity by (again!) bashing refugees. There were protests around the country. Crossbench Senators were inundated with emails and phone calls after Labor joined the Greens to oppose the Bill. On 12 November, four days after it became clear that Donald Trump would win the US presidential election, the Turnbull government hastily announced a deal with the US to resettle “some” refugees from Nauru and Manus Island. However, there was precious little detail. The announcement was more a passing parade of military officials of Operation Sovereign Borders and uniformed bosses of Australia’s Border Force. Turnbull boasted he had ordered the “biggest ever peacetime maritime operation in Australia’s northern waters” forming “a ring of steel” to repel any asylum boats attempting to come to Australia. A month later, while hundreds of refugees on Nauru have left their names as “being interested” in the US deal, there are still few details. Although the deal supposedly applies to refugees on Manus as well, nothing about the deal has been officially mentioned there. The deal will potentially leave hundreds of asylum seekers and refugees on Manus and Nauru. Given the anti-Muslim and anti-immigration rhetoric of US President-elect Trump, it is possible that he will simply renege on it. Sky News declared that the US would accept between 300 and 400 from family groups; no single men. Dutton says that is not true, but only ever says “some” refugees will be resettled. US officials only say that the final number has not been determined. What is very clear is that the US deal will not provide a resettlement solution for everyone on Nauru. Asylum seekers whose claims have not been fairly processed; rejected refugees who cannot be returned to their home countries; single men; those who are rejected by America will remain on Nauru. The US deal may provide an outcome for some families—but the campaign to “Bring Them Here” is going to revive as the flaws in the deal become even more obvious. 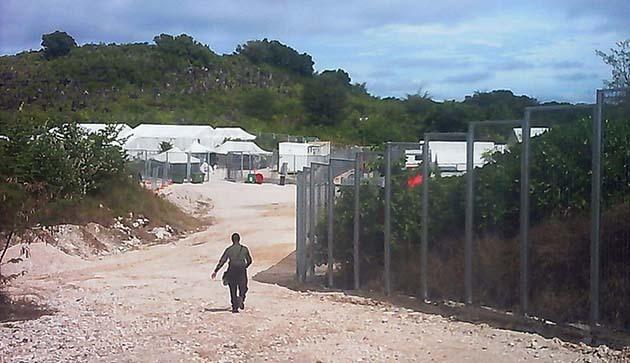 Refugees on Nauru aren’t being told who will, or will not, be in the running but they are being officially told that the process, even for those who are accepted, will take months. Border Force has also approached asylum seekers and refugees from Manus and Nauru who are in detention in Australia and told them that they will have to go back to Nauru or Manus to be considered for the US deal. But there are no guarantees that they will be resettled. Going back to Nauru would be a leap into the unknown. Similarly, the US deal will separate those who are on Nauru and Manus from uniting with families already in Australia who were never sent to the offshore camps. Refugees resettled in the US would have to wait for permanent US residency to make applications for family members to migrate there. There are too many problems with the US deal for it to be accepted as any sort of “solution”. The deal would still leave offshore detention in place. Dutton has said that Nauru will remain an Australian detention option, indefinitely. Shamefully, despite opposing Turnbull’s lifetime ban, the Labor Party leaders still only talk about “third countries” for resettlement. The campaign will need to break the Labor Party from their bi-partisan support for offshore detention. Meanwhile, despite the delays, court action is still pending in PNG to finally force the PNG and Australian governments to close Manus Island, pay compensation and return those on Manus to Australia. The US deal has opened up cracks in the offshore detention regime as never before. But the refugee movement needs to seize the opportunity to step up the campaign to “Bring Them Here” and end the barbaric offshore policy altogether.